[08/24/2018 @ 8:34 PM] Book this fare on: Priceline, BookingBuddy, Travelocity, Expedia, Orbitz, Hotwire, CheapTickets. 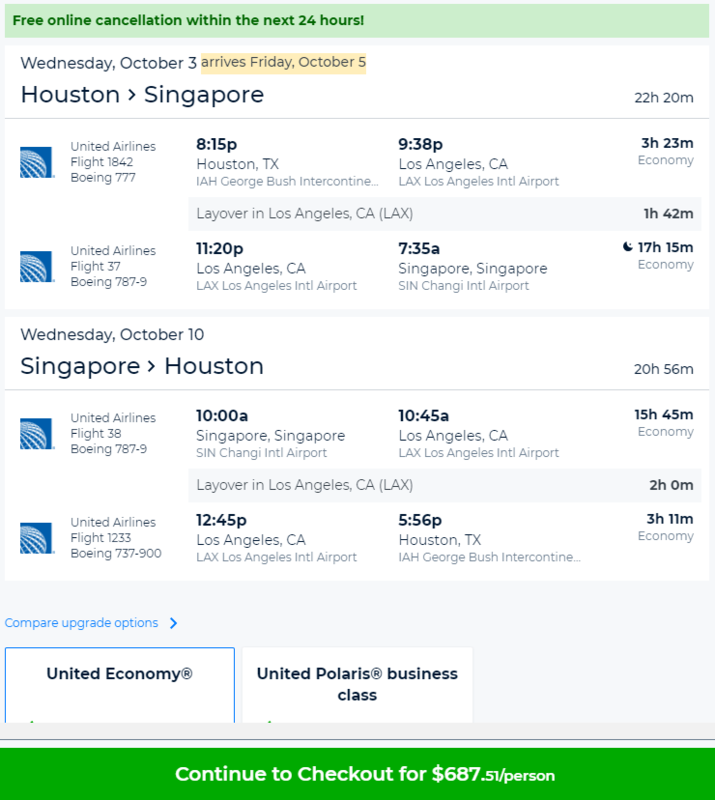 ANA and United have round-trip flights from Houston (IAH) to Singapore (SIN) for $688-$698. Flights from October to March. Holiday Blackouts apply. 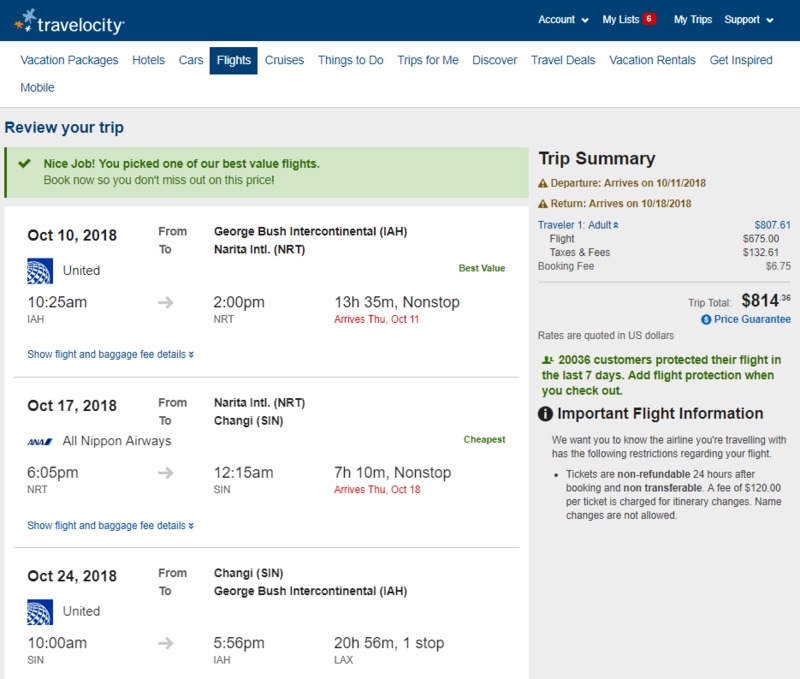 Note: Fare allows for a stopover in Japan for +$120 more. If you’re wanting to spend a few days (or weeks) in Japan before going to Singapore, consider doing IAH-NRT-s-SIN-IAH. Example screenshot below. Note: Some small OTAs on SkyScanner have this for $635. If you plan on booking there, beware of any site that charges a fee to cancel a ticket within the 24-hour “free” period. Use unknown booking sites at your own risk. Example Dates: (BookingBuddy / Priceline) Oct 03 – Oct 10 / Oct 10 – Oct 17 / Oct 17 – Oct 24 / Oct 24 – Oct 31 / Oct 31 – Nov 07 / Nov 08 – Nov 15 / Nov 14 – Nov 21 / Nov 22 – Nov 29 / Nov 28 – Dec 05 / … / Jan 09 – Jan 16 / Jan 16 – Jan 23 / Jan 23 – Jan 30 / Jan 29 – Feb 05 / Feb 06 – Feb 13 / Feb 13 – Feb 20 / Feb 20 – Feb 27 / Feb 26 – Mar 05 / Mar 05 – Mar 12 / Mar 13 – Mar 20 / Mar 20 – Mar 27 / Mar 27 – Apr 03 / Apr 03 – Apr 10 / Apr 10 – Apr 17 / Apr 17 – Apr 24 / Apr 24 – May 01 / etc… / May 31 – Jun 07 / Other dates: There are more dates available than the ones we list here, experiment on your own. I was able to pull this up on Travelocity and Priceline. Screenshot taken when this post was last updated. See timestamps at the top of this post.